I’m sitting in the back room at The Writer’s Block with a handful of other people. 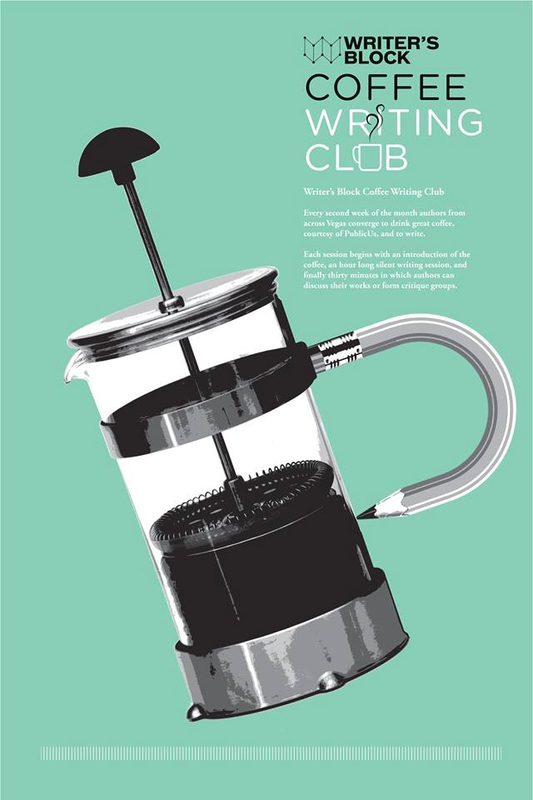 We’re here for the Coffee Writing Club, a bi-weekly gathering of folks who assemble to drink some good coffee (generously donated by PublicUs down the street), chat, and even get some writing done. I have to drive across town for this one-hour event, and over the past couple of months, I have not missed a single session. Kind of crazy, don’t you think? I could stay home, save time and gas, and write in my nicely appointed study. I might even get more done. The Writer’s Block doesn’t even have wifi. Other days, I go to Grouchy John’s, which is nearer home. I could say that I’m drawn there by the coffee, which is excellent, but that would not tell the whole story. While I do love good coffee and appreciate its stimulating effects, I could brew myself a cup at home. Why bother making the trip to Grouchy’s? He does provide wifi, but I have wifi at home. Here’s my attempt to explain. While some writers work best alone and in utter silence, I’m usually more efficient and motivated inside a pleasant bubble of white noise. That’s what I step inside when I arrive at the Coffee Writing Club or take a seat at Grouchy’s. After a bit of friendly chit-chat and whatever it takes to get a cup of joe, nobody’s paying any attention to me, and I’m pretty much ignoring everyone else. Somehow, though, our presence in the same room at the same time doing solo tasks creates a sweet kind of energy. It’s not only caffeine that gives my creativity a boost. It’s that other mojo that helps me focus less on fear of failure and more on transforming nebulous literary intentions into real words. 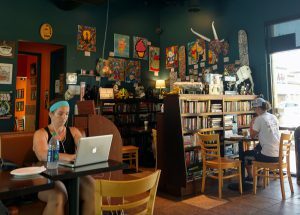 Grouchy John’s Coffee Shop has art, books, other writers, and great coffee. It all adds up to irresistible. I credit the owners and staff of The Writer’s Block and Grouchy John’s with establishing and nurturing environments that attract and support writers and other creative folks. Without agenda beyond good business practices, both the bookshop and the coffee house have made themselves magnetic. The Writer’s Block has an outstanding selection of well-curated books and hosts workshops, clubs, and events for both children and adults. I would never have thought it possible that a little store nowhere near where I live would induce me to darken its doorway at least once a week, but that is now true. 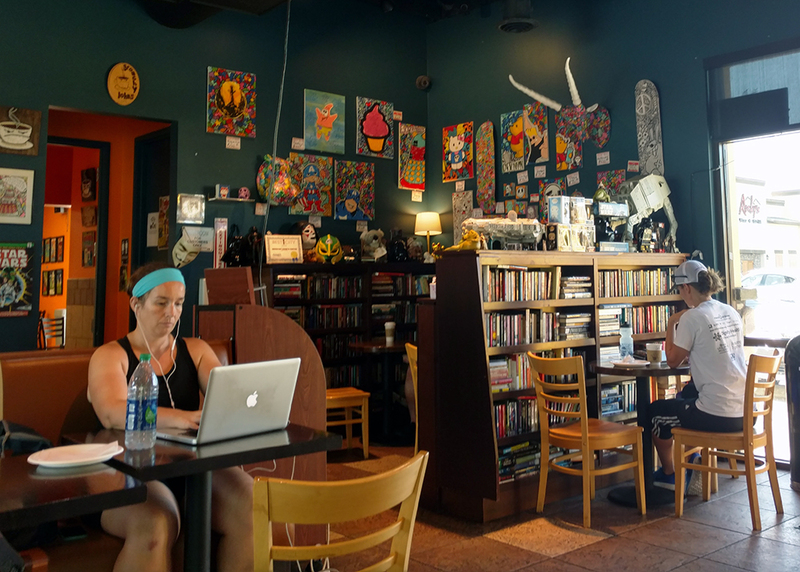 Grouchy John’s, with its art-covered walls and shelves packed with books has also become one of my favorite places. It is both unsurprising and wonderful that both of these establishments are enjoying popularity and success. Grouchy John’s just opened a second coffee house across the street from the College of Southern Nevada. The Writer’s Block is getting ready to double in size. Clearly I am not the only one who appreciates the talents of Drew and Scott at The Writer’s Block and JJ and John at Grouchy John’s. Along with their staff members (like James who hosts the Coffee Writing Club), they work every day to maintain their unique and inviting brand of hospitality. I’d be happy enough if all I ever got from either store was a book or a cappuccino. I consider it a tremendous blessing that I receive so much more. I’m not talking about wifi.